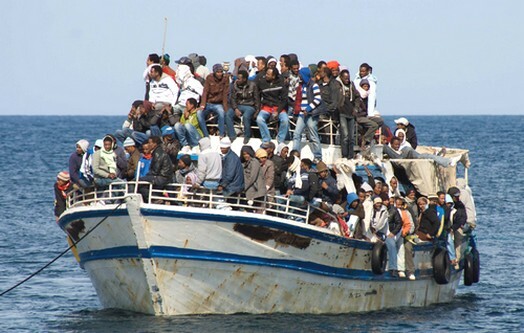 Mid-April 2015 will go down in Mediterranean history as a time of terrible tragedies. In ancient times called the Great Sea and Mare Nostrum, meaning “our sea”, it is coming to be known as the “sea of death”, having become the grave of many hundreds of immigrants, who risked the perilous journey from its Southern shore to what seemed to them the paradise of the Northern shores. On that fateful day nearly a thousand people died and even the European press that normally does not take refugee problems close to heart wrote that this was a “dark day for the European Union”, a catastrophe more appalling than the sinking of the Titanic. Thousands of residents of African and Asian countries, in search of a better lot in life, hoping for a decent existence or simply striving to survive death by starvation, disease or conflicts ravaging their continent, have for many years been making desperate attempts to reach the European continent by whatever means possible. Many of these unfortunate people believe that there, in Europe, they might find salvation: there they will have food and a roof over their heads. Whereas in their native countries, they live in shacks on a dollar a day if lucky. Many don’t have the slightest idea, since they are illiterate and uneducated, of what riches their countries hold in minerals and natural resources, and how ruthlessly they have been exploited for the past two centuries by the world’s richer inhabitants. This chasm between rich and poor continues to widen, inequality in wealth distribution takes a dangerous role. According to a report published early this year by Oxfam, an International charity organization, the top 1% of richest people in the world by 2016 will be richer than all of their contemporaries. And even today, the richest 85 people on this planet possess as much wealth as the poorest 3.5 billion. The problem of migration from the African continent has grown to be considerably more difficult as a result of the chaos and anarchy reigning over Libya. Difficulties with immigration were present in time of the unanimously considered odious, Muammar Gaddafi, but just as with attempted terrorist acts by Islamic extremists, the Jamahiriya administration dealt with these issues. After the NATO bombings of Libya in 2011 and Gaddafi’s brutal murder, the government, at the time safe and stable, began to disintegrate before our eyes. The lack of order and safety of any kind led to the fact that now, according to The Independent as of April 21, around 1 million refugees from Syria, Somali, Eritrea and other African and Middle Eastern countries have congregated there, hoping to move on to Europe. In addition, Libya has become a useful foothold for Islamic State militants. This all weaves into a tight knot of colossal problems, for which, according to the Lebanese newspaper, Daily Star, the European Union is chiefly responsible. What a bitter grimace of history: military actions by England, France and other NATO countries were, as they claimed, aimed at the “protection of civilians”. But the Europeans don’t like to be reminded of that. All of this is accompanied by newly incited religious hatred. On April 19, the ISIS released a video of the brutal execution of 29 Ethiopian Christians in Libya, and this being a short two months after the cruel violence against 21 Egyptian Copts. April 16 saw every major information agency reporting that as a result of disagreements arising on an inflatable boat carrying immigrants, Muslims threw 12 Christians overboard, all of which died. According to official reports, 3.5 thousand immigrants drowned in the Mediterranean in 2014, although the media suspect that the real situation is much worse and more horrific. Among experts, the general opinion is that this tragic and danger riddled situation is a direct result of the policy of the EU that has not been able to produce any kind of decision in relation to these illegal immigrants and practically, as stated in the New York Times on April 19, “tramples on its own humanitarian values”. “Isn’t it a shame of Europe, – emphasized the comments by Deutsche Welle on April 20, – that in this last decade alone, according to approximate data, 25 thousand immigrants died on the Mediterranean?” Europeans have attempted to build around Europe a kind of fortress and close the borders, limiting the admission of new immigrants. As a result, migrants were able to apply for political asylum, only having set foot on the territory of a European nation. Attempts to apply a naval blockade to Libya have also left them empty handed. Transporting illegal immigrants is a well-established and profitable business, where smugglers earn billions. The above mentioned comment by Deutsche Welle proposes that immigration policies be altered and 2 to 5 million aliens be accepted annually as political refugees. Applications for political asylum and migration permission should be reviewed in the future by EU embassies in the immigrant’s native country or in transit nations en route to Europe. This undertaking would allow potential immigrants to avoid the difficult trip to the coast of Africa and the even more dangerous sea-crossing on boats. The author of this comment admits that the probability of this type of policy being put into practice is small, but believes that if Europeans are not ready to accept and integrate a considerably greater number of immigrants even in the long view, then at least this should be openly and directly addressed. And it follows that the necessity will arise to deport illegal aliens without exception, fending them off, so that they will not count on a “life of paradise” in Europe. Everything depends on the strenuous business of developing an effective, far-sighted strategy for the issue of migration, taken in conjunction with conflicts in the Middle East and integrated Muslim minorities in EU nations. However, the European governments are so consumed with the desire to preserve their all too familiar comfort, that they don’t even glance at the dangerous events already creeping over the sea’s horizon, refusing to realistically evaluate their priority scales. For example, is the stance of the European Union leadership on the Ukraine not absurd, with their obsession with creating obstacles and difficulties for Russia in the face of the real threat of Islamic radicalism, a new occurrence with horrific and unpredictable consequences for the European nations?